One of the most important things I learned during the the Periodization (Annual Planning) task of my Squash Canada Level 4 Course in 1987, was the importance of sequencing training activities within a practice according to the principle of “fatiguability of the Central Nervous System (CNS)” (Bompa, 1999). This principle states that activities that require a fresh well-rested athlete should be performed first, while those activities that can have a good training effect when performed in a fatigued state should be carried out later in the practice. If you look at the practice plan for the Smith College Squash Team’s fourth day of practice, in the first week of the season you can see a specific application of this principle. The practice starts with athletes working on changing/improving their technique. After a brief warm-up the team trains agility and speed, both of which depend greatly on the nervous system (brain-muscle signals). The main part of the practice is spent on practicing tactics using the Games Approach, which starts with a conditioned game, followed by drills to improve performance in the game, and another game to assess learning and improvement. I would rate this as a medium-level physical effort (although there should be some cognitive effort on the part of the athletes) with an average heart rate of about 150 bpm (or 75% of HRmax so there is some aerobic training benefit). “Warmed-up” athletes move into a strength-endurance workout (10-12 reps with medium weights) which does not require the CNS to be as fresh as for a maximum strength or speed-strength workout. Since squash is a sport requiring a high degree of technical skill, strength workouts of any type would normally follow the on-court portion of the practice. Aerobic training would be classified at a medium level of intensity on an absolute scale, and since it does not require significant skill or coordination is usually done at the end of practice. Stretching and mental training can allow the athlete’s body to return to resting levels prior to resuming their day. Sequence practice activities according to the potential fatigue level of your athletes to improve learning and training benefits. 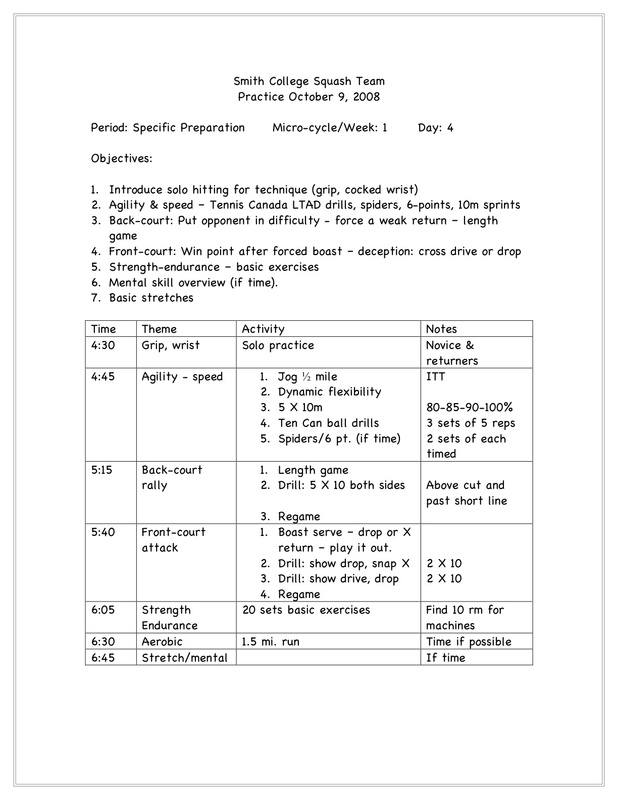 This entry was posted on Thursday, October 9th, 2008 at 6:58 PM and is filed under Pedagogy-Motor Learning, Physical-Physiology, Planning, Technique. You can follow any responses to this entry through the RSS 2.0 feed. You can leave a response, or trackback from your own site.